Central Queensland Plane Spotting: Australian Corporate Jet Centres Bombardier Challenger 604 Bizjet VH-SCR Calls into Mackay Airport on Federal Election Duties as "Envoy 534"
On Sunday 14 April, Australian Corporate Jet Centres Bombardier CL-600-2B16 Challenger 604 bizjet VH-SCR was photographed parked at Mackay Airport. It had earlier arrived from Canberra and Wagga Wagga as "Envoy 534". VH-SCR seems to have been chartered to ferry politicians around Australia during this Federal election campaign. It brought National Party Leader and Deputy Prime Minister Michael McCormack to town for a series of engagements. 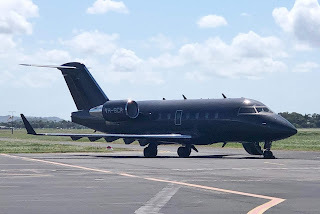 VH-SCR departed Mackay Airport for the Gold Coast during the middle part of the afternoon. Meanwhile, also at Mackay Airport last week, on Thursday 11 April, locally-based Embraer EMB-550 Legacy 500 bizjet N142GZ departed to Brisbane, It returned to its Mackay Airport from the capital on Saturday 13 April.